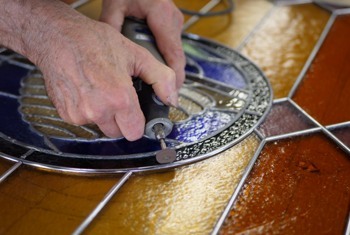 Heritage’s staff recently completed the restoration of several stained glass panels for a local church. These pieces had become worn and discolored with age. Using our new stained glass repair studio, the glass was carefully disassembled, cleaned, and put back together with fresh lead. The restored stained glass were placed into four custom-built light boxes for indoor use. Once the assembly was complete, we delivered and installed the light boxes at our client’s location. Heritage Restoration and Design was invited into this project by the pastor and church committee as design support for a local architect and was ultimately awarded a contract for a variety of components. Originally this church was constructed in the mid 1900s and unfortunately burned to the ground. It was later rebuilt but not to the same scale or architecture. In the early 2000s it was decided that an interior renovation was needed to bring back many of the lost elements during the reconstruction. Heritage, through its experience in this field, coordinated design elements with a local architecture firm and rough construction details with a local general contractor. Final installation of furnishings and artwork were completed by Heritage’s artisans. Heritage Restoration and Design Studio's first interaction with Our Lady of Prompt Succor Church was when they became the unfortunate victims of a series of vandalisms. 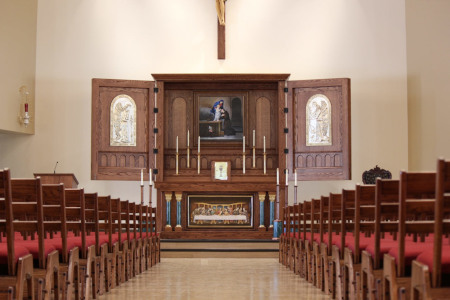 Through the restoration of these destroyed artifacts, Heritage was asked to design a series of church furnishings to better utilize the existing space. The furnishings design had to incorporate the traditional orders of architecture with influences from local and French traditions of the area.